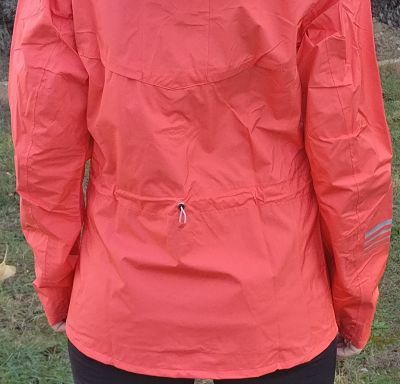 My Salomon Lightning Jacket Review. 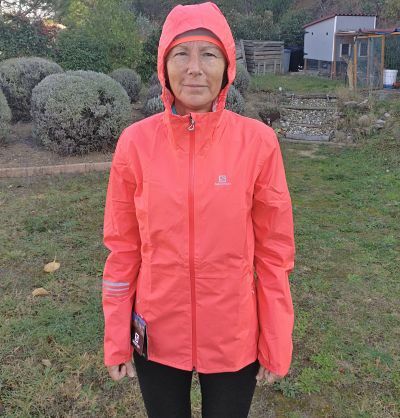 I had been looking for a lightweight running jacket that I could wear during my planned 80km trail in Paris and the name Salomon kept on popping up. So once the sales started, I grabbed myself a Salomon Lightning waterproof jacket. 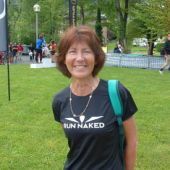 Sizing: Although I normally wear a size S/36/8-10 in everyday clothes, I don't like to feel restricted when running. I contacted Salomon directly through their website and got a very quick response from a female who happens to be the same size as me (50kg and 165cm). M is what she recommended and I am happy with it. So I would say that sizing is fairly accurate but if you like a loose fit and are hesitating between sizes, then go for the bigger size. 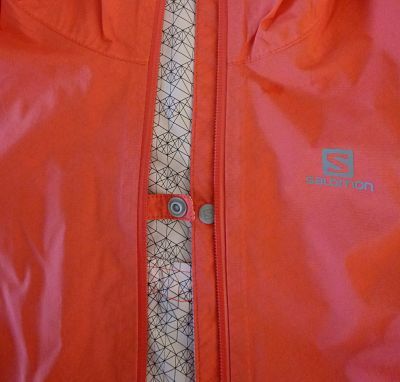 Material: The salomon lightning jacket says that it has a 10k/10k waterproof/breathability rating. That means it should be fairly waterproof in light rain and should have a fair level of breathability. See how the ratings are calculated. 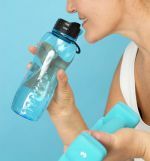 The materiel itself has a slight stretch to it, making it comfortable when you move. It is a little bit noisy but certainly not as noisy as some other waterproof jackets. The inner lining does feel somewhat plasticky so I was interested to see how breathable it would be. I was lucky that we've had some pretty grim weather recently - cold, wet, snow and wind. Perfect for testing the jacket. I've worn it on several runs, mostly trails and usually between 1 - 2 hours. Initially I found the jacket very comfortable to wear, not restricting at all and I certainly felt protected from the elements. The waterproofing is excellent and I felt warm even with just one layer on underneath. When I got hot and wanted to unzip the front of the jacket, there is a very nifty popper that you can use in order to stop the jacket flying right open. The 2 pockets are big and roomy and could hold my mobile phone. I would have preferred a chest pocket as I find you need to balance the weight of the pocket contents in order to not feel lopsided. The sleeves were nice and long so kept my hands warm but I could easily move them back to see my GPS watch. However there were some issues. The hood covered my head well but somehow it felt a bit big. The inner mesh was loose so didn't hold all my hair back and with strong wind the hood blew back (not right off). I also found that when turning my head, the hood didn't seem to turn with me. I think what would have helped would have been a drawstring tie behind the hood so that I could tighten it to fit. I felt there was a distinct lack of reflectors for night time running. There are 4 stripes on one arm and that is it. The biggest issue for me though was the breathability. Or lack of it. Even on cold runs, I found that the jacket was damp on the inside after an hour or so. This meant that I quickly became cold. The inner lining feels plasticky and for me, that is the big let down of the Salomon Lightning jacket. The Salomon Lightning jacket definitely looks good and on the whole it is a pretty good jacket for walkers and runners. In general it has some great characteristics such as the front popper and being able to stuff the jacket into one of its pockets. Waterproofing and wind-proofing are also excellent. I do really like the jacket and I would certainly wear it for short and rainy runs. However I think I would choose a different jacket for hard runs or very long runs because of the breathability issue.